My wife bounded into the bedroom gasping for air, eyes widened, and phone in hand. “Scott, the shuttle just exploded!” Dazed, I raised my head from the warmth of my pillow and peered over the quilt that was keeping me so comfortable on that cool February morning. I tried to make sense of what she had said. “Exploded,” I thought to myself. “No, it must be a mistake.” The Space Shuttle Columbia was in orbit, completing an exciting science mission and was to returning to Florida that morning for landing. No orbiter was scheduled for launch. Now normally during a launch or landing, you would find me in front of the computer watching NASA video-feed, but after a long work week I was taking a few more moments of much needed rest. I jumped from my bed, headed to the living room, picked up the remote, and began watching television, shocked at what had just occurred over the skies of Texas. Nearly two years had passed since I first met Laurel Clark and Kalpana Chawla. They, together with other representatives of the astronaut corp, gathered with us in our small university community of Indiana, Pennsylvania to mourn and celebrate the life of friend and colleague, astronaut-physician Dr. Patricia Hilliard Robertson. It was a day full of emotion, but in between the mix of laughter and tears, I will forever remember the look in their eyes and the occasional exchange of glances across the room. Gathering the spirit of courage and strength left to them by their friend had only added to their passion and unbroken determination to press forward and reach for the stars. Months later I found myself roaming the buildings and hallways of NASA’s Johnson Space Center. It was a typical hot and humid afternoon in Houston as we entered Building 9’s Space Vehicle Mockup Facility – a large, somewhat museum-like room full of space vehicles where astronauts spend countless hours in spacecraft simulators rehearsing procedures and preparing for their upcoming missions. As we walked towards the Shuttle simulator, a tall, energetic gentleman walked towards us with a smile as big as a young boy in a candy store. Rick Husband loved what he did, there was no mistake, and he wanted us to love it too. 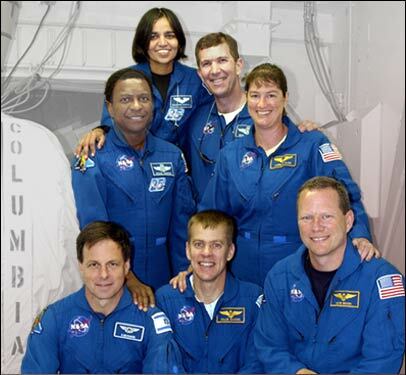 Ten years have passed since that tragic February morning and we have learned much about the Columbia disaster and the crew of STS-107. We’ve learned all about the potential effects of external tank foam shedding and strikes. We’ve learned new flight profiles to pitch a spacecraft end over end for in-flight inspection. We’ve learned tile repair techniques. We’ve gained insight into the results of some of the science experiments from data downloaded during the mission. We’ve come to know the personal and professional stories of each of the crew. We’ve learned there is a calculated risk and cost in exploration and discovery. We’ve learned there are risks worth taking. We’ve learned the value of teamwork, diversity, and cooperation. But what have I learned as a result of the events of February 1, 2003? While I may have taken some lessons in discipline and determination to fuel me with inspiration to reach for a dream, today I am thankful for a greater lesson in faith and grace. To Rick and Evelyn Husband-Thompson, thank you for your encouragement not only in your story and in your book, but also in your notes. Thank you for reminding me of a grace that gives us purpose and allows us to pursue our highest calling.